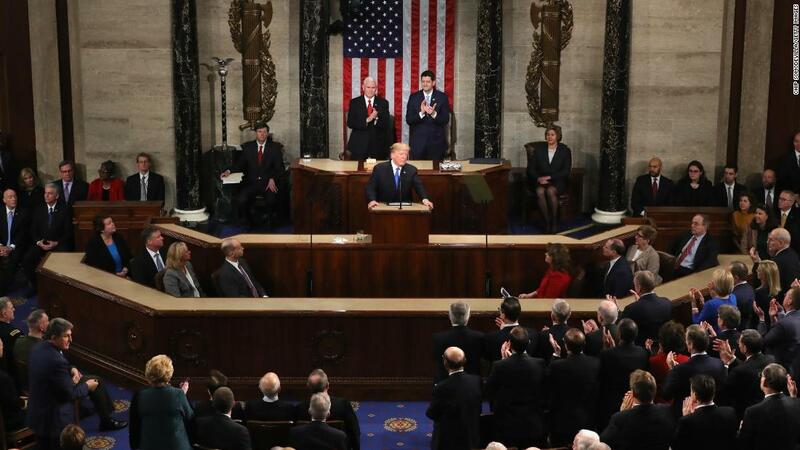 Washington (CNN) When Trump gave his State of the Union address last year, he was coming off one of the highest points in his presidency. He had just signed a huge tax cut into law and removed the Obamacare mandate penalty. Both the House and Senate were controlled by Republicans, and he was enjoying some of his highest approval ratings as president. According to one senior administration official, the theme of Trump’s speech is “choosing greatness.” Topics are set to include the economy, immigration, trade, healthcare, and foreign policy. “It’s going to be a speech that’s going to cover a lot of territory,” Trump told reporters last week. As a pre-SOTU guide, we’ve taken a look at the President’s recent rhetoric and the facts around the topics he may touch on. More than anything else, the issues of immigration and border security have consumed Trump’s first two years in office. Here’s a look at some recent talking points and whether they’re true. Trump said this in an interview with the New York Times last week, and according to Drug Enforcement Administration and Customs and Border Protection data, it’s incorrect. Trump made a similar claim last week when he announced a potentially temporary end to the government shutdown. But, according to data from the DEA and the CBP, this is not true. In fact, in the DEA’s 2018 National Drug Threat Assessment the agency reported that marijuana was the one drug where the majority coming across the southern border came in the US between ports of entry. “Unlike other illicit drugs,” according to the analysis, “the majority of marijuana smuggled into the United States occurs between the ports of entry on both the northern and southern borders.” For example, the CBP seized 67,292 pounds of methamphetamine at legal ports of entry and 10,382 pounds by Border Patrol agents in between ports last fiscal year. Available Customs and Border Protection data shows a total of 396,579 people were apprehended by the US Border Patrol for fiscal year 2018 at the southwest border, which would mean an average of 1,087 each day — hardly the “thousands” that Trump purports. The numbers differ each month. The highest number of apprehensions was in September, with a daily average of nearly 1,400. The nation’s immigration courts have been faced with a massive backlog. The number of pending cases stands at 809,041, according to Syracuse University’s Transactional Records Access Clearinghouse, which tracks immigration court data. The government shutdown made that worse, as only courts that handle detained dockets (the cases of people who are in immigration detention) were allowed to proceed. A report released by the Transactional Records Access Clearinghouse last month found that an estimated 42,726 immigration court hearings had been canceled as a result of the shutdown. It’s unclear when they’ll be rescheduled. For months, Trump has raised the specter of “terrorists” crossing the US-Mexico border. He brought this up repeatedly before the 2018 midterms when a caravan of migrants, primarily from impoverished Central American countries, marched through Mexico toward the US border. Recent reporting revealed that the actual number encountered on the southern border is nowhere near the staggering 4,000 figure. An administration official told CNN that only about a dozen non-citizens on the terrorist watch list who were stopped at the US-Mexico border in fiscal year 2018. That is a tiny fraction of all known or suspected terrorists who tried to enter or travel to the US in that timeframe. Additionally, a State Department report from 2016 said there was “no credible information that any member of a terrorist group has traveled through Mexico” to sneak into the United States. Bergen noted that the most notorious case of a terrorist apprehended at the US border is the “millennium plot,” when an Algerian citizen with ties to al-Qaeda was arrested at the US-Canada border in December 1999. He hoped to blow up Los Angeles International Airport. This is essentially true, but the numbers have ticked up in recent months. CNN fact checked this claim last year, noting up front that it’s not really possible to determine whether these rates are the lowest in history because the available data simply doesn’t go back that far. That said, Trump is essentially right on all three counts, since all three measures are the lowest since they started being recorded. The Hispanic unemployment rate reached its lowest point on record in July, at 4.5% and has since increased to 4.9%. The rate for African-Americans reached its lowest point on record in May, at 5.9%, and now stands at 6.8%. The rate for Asians also reached its lowest point in May, at 2.0%, and has since increased to 3.1%. Trump likes to claim that more people are working now than at any point in the history of the United States. As we noted in our 48-Hour Fact Check from October of last year, this is essentially true, though it’s been true for a while now. Employment has been growing steadily since the bottom of the recession in 2010, and it now stands over 150 million, according to the Bureau of Labor Statistics. That’s well above the pre-recession peak of 138.4 million from January 2008, which was regained in May 2014, when the number of working Americans hit 138.6 million, according to payroll data. As a share of the total population, however, employment remains a touch below its all-time high in 2000. This is true, but it needs context. By the time former President Barack Obama left office, there were some 190,000 fewer manufacturing jobs than existed at the start of his administration. But that doesn’t tell the whole story. The US was in a deep recession when Obama entered the White House in January 2009, and the manufacturing sector was shedding tens of thousands of jobs a month. But the losses stopped by early 2010. Over the next six-plus years, manufacturing jobs rose by more than 800,000. The reason for this result is likely multifaceted. Oil prices dropping, healthy job numbers nationwide, and deregulation are all often cited reasons for the uptick. However, the decline in vehicle sales paired with uncertainty around trade might harm these numbers. Also, while the number of manufacturing jobs continues to increase, the total is still below its pre-recession level. This is a bit misleading. Since Trump took office, some mills have restarted, gone through renovations and been expanded. But it’s important to note that the vast majority of this work was planned years before Trump took office, according to industry analysts. Last year about 11,000 jobs were added to the steel industry, but the total number is still lower than it was four years ago. It’s unclear, too, how many jobs will continue to be added, given the efficiency of automation and the continued progress of current tech. Since his last State of the Union address, Trump has enacted billions of dollars in tariffs and also renegotiated the NAFTA trade deal. He is likely to touch on both tonight. When Trump talks about tariffs, he often talks about the amount of money that is now pouring into the US Treasury. He tends to give the impression that money is being paid by foreign companies. But that’s not really what’s happening. Instead, most of those tariffs are being paid by US companies that import those foreign goods. The real question is who bears the cost. Often, US companies will pass it onto the consumer by raising prices, while other times a company will reduce compensation or employment internally to offset these higher costs. In some instances, the Chinese supplier might take on the burden of the tariff by reducing its prices in order to maintain its price advantage in the US. Trump is trying to realign trade so that US products become more competitive with their cheaper Chinese alternatives. That will likely require a long-term adjustment of the US industrial base. In the short term, US consumers and companies will most likely end up bearing the cost of the tariffs. The Tax Foundation said last year it expects the tariffs to lower GDP and wages, and cost American jobs, hitting lower- and middle-income households the hardest. Trump touts his trade deal with Canada and Mexico as a big win, but the new agreement isn’t drastically different from the existing North America Free Trade Agreement. NAFTA already eliminated most tariffs on goods traded between the three countries. While many parts of the original deal would remain intact, the new deal — known as the United States-Mexico-Canada Agreement or USMCA — does include a brand-new chapter on digital trade. It also would create restrictions on auto manufacturing, requiring more of a vehicle’s parts to be made in North America and by workers earning at least $16 an hour in order to remain tariff-free. The deal also opens up Canada’s dairy market to US farmers. The USMCA needs approval from both chambers of Congress before it can go into effect. Its passage is no sure thing, as Republicans and Democrats have expressed concerns. Trump’s isolationist agenda has been fast-tracked in recent months, particularly as he has promised to withdraw troops from Syria. Trump made this claim in a video on Twitter posted in December. But a recent report from the Pentagon’s Inspector General and the Worldwide Threat Assessment released last week paint a different story. Victories against ISIS should not be understated, but suggesting that they have been defeated is not accurate. Trump has long said the US should leave Afghanistan, calling the war a “complete waste.” Yet he boosted the number of American troops there by almost 4,000 during his first year in office and heralded the fact that the military was no longer hindered by an “artificial timeline” for exiting the country during last year’s State of the Union address. But Trump is expected to pivot back to the need for an Afghanistan exit tonight. Over the weekend, he reiterated that the US must get out of “endless wars” in Afghanistan. In an effort to prevent Trump from making any rash decisions like he did with Syria, Afghanistan’s President Ashraf Ghani wrote Trump a letter last week inviting him to Kabul where the two could discuss how to cut down the cost of the US presence and the number of US troops in the country. Trump has received that letter, says a NSC spokesperson, and he could reply to that invitation by Tuesday night, according to Afghan sources. It will also be key to watch what Trump says about the Taliban. Trump initially said his administration does not negotiate with terrorists but in recent weeks the State Department confirmed that the top US Envoy for Afghanistan met with the Taliban in Doha. These meetings have led to tension between the US and the Afghan government, which has not been at the table with the Taliban thus far. The Trump administration is working to smooth over these tensions. The Taliban is operating from a position of power in that they now control more territory in Afghanistan than they have at any time since the war began. As a result, the Afghan government’s hold on territory is weaker than ever before — they now control 16 percent fewer districts than they did in 2015, according to a recent Special Inspector General for Afghan Reconstruction (SIGAR) report. As he prepares for a second summit with North Korean leader Kim Jong Un, Trump continues to praise the Communist dictator and the progress the two have made toward nuclear disarmament. After the first summit in June 2018, Trump tweeted “there is no longer a Nuclear Threat from North Korea.” His intelligence chiefs disagree. When Trump announced in May 2018 that the US would be pulling out of the Iran nuclear deal, he cited the potential for Iran to build nuclear weapons as one of the primary reasons. The US intelligence community believes Iran is continuing to comply with the deal and is not currently working on creating a nuclear device. The report notes that Iranian officials have threatened to abandon parts of the deal if they don’t start seeing financial benefits. The topic of healthcare has taken a back seat recently, but Trump is likely to touch on a few key issues tonight. The President often claims credit for lowering drug prices — one of his key campaign promises. It’s true that his administration has focused on the issue. Since unveiling a 44-page blueprint last May, the Department of Health & Human Services has rolled out several proposals aimed at lowering drug costs. But overall, it hasn’t moved the needle much. Experts say most of the efforts would have marginal impacts. However, the agency has floated two more significant ideas: The first would ban drug makers from providing rebates to pharmacy benefit managers and insurers, while the second would set Medicare’s reimbursement level for certain pricey drugs based on their cost in other countries, which is typically far lower. Trump continues to lambast drug makers on Twitter for raising their prices, most recently at the start of the year. Sixty drug makers kicked off 2019 by raising list prices on nearly 300 medications, according to an analysis by Rx Savings Solutions. And more drug manufacturers are expected to quietly follow suit in coming weeks. Companies do appear to be tempering their hikes. The average increase was 6.3%, down from nearly 9% a year ago, taking into account different dosages of the same drug. One thing that the Trump administration has accomplished is approving a record number of generic drugs, which typically have lower prices. Sources familiar with the speech confirmed to CNN that early drafts included Trump calling for an end to HIV outbreak in the US by 2030. Previously, the Joint United Nations Programme on HIV/AIDS set a goal to end the AIDS epidemic by 2030. In its report, the UN estimated that “new HIV infections have been reduced by 47% since the peak in 1996” worldwide. Organizations and programs focused on HIV/AIDS prevention cite financial constraint as one of the primary roadblocks — along with education and a reduction of the current stigma — on the way significantly reduce the number of outbreaks. It’s unclear what plan the administration might have to reach this potential 2030 goal. During our 48-hour Fact Check of the President last year, we examined several claims Trump made around opioids in the US. Reputable studies back this up, but it didn’t happen under Trump’s watch. A report from the Centers for Disease Control and Prevention found that there was an 18% drop between 2010 and 2015. And according to the American Medical Association there was a 22% drop between 2013 and 2017. These trends largely predate the Trump administration and much of the drop has been attributed to changes in prescribing regulations and guidelines. In the past two years, the Department of Health and Human Services uncovered $3.3 billion in Medicare and Medicaid fraud but it wasn’t all related to opioids. Some of the fraud related to illegal kickbacks and false bills for unnecessary medical procedures. That said, HHS did blacklist nearly 900 doctors and nurses “based on conduct related to opioid diversion and abuse,” meaning they can’t participate in federally funded health care programs. He’s right. Congress allotted a record $6 billion over two years to combat the opioid epidemic. Previously, the 21st Century Cures Act, which Obama signed in December 2016, directed $1 billion over two years to states to fight the nationwide opioid epidemic.